Do you see that crowd forming? 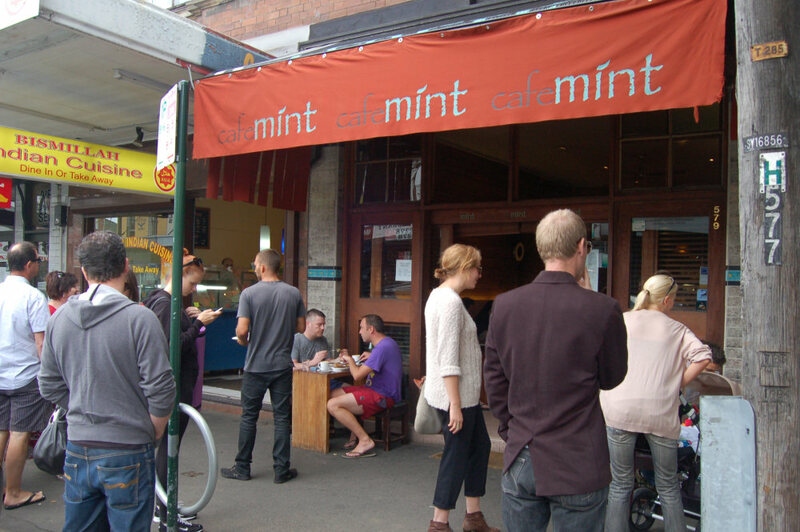 They’ve obviously been to Café Mint before and know what to expect in terms of a great breakfast experience. Located on Crown Street in Surry Hills very close to the corner of Cleveland Street, we were very lucky to get there before the late morning public holiday rush. There are only two tables outside – very small, simple tables with even smaller stools that tuck inside them. There are maybe twelve more tables inside. It’s a small, busy café with quick, professional and attentive staff. As you take a seat you too may notice the touch of mint in the air. Funky trip hop and 80’s-style tunes bump in the background as we settle in. 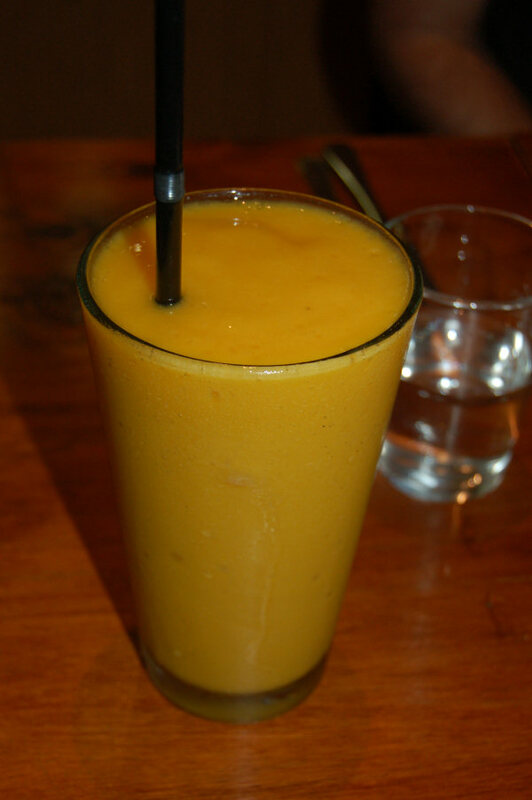 April: The Orange, banana and mango frappe ($5) was thick, cool and delicious. So thick in fact that I had to get half of it to take away at the end of the meal. I enjoyed this after I digested my yummy breakfast. Other flavours were mixed berry/pineapple, lemon & mint/grapefruit & almond. So nice to see a few variations to the common offerings. 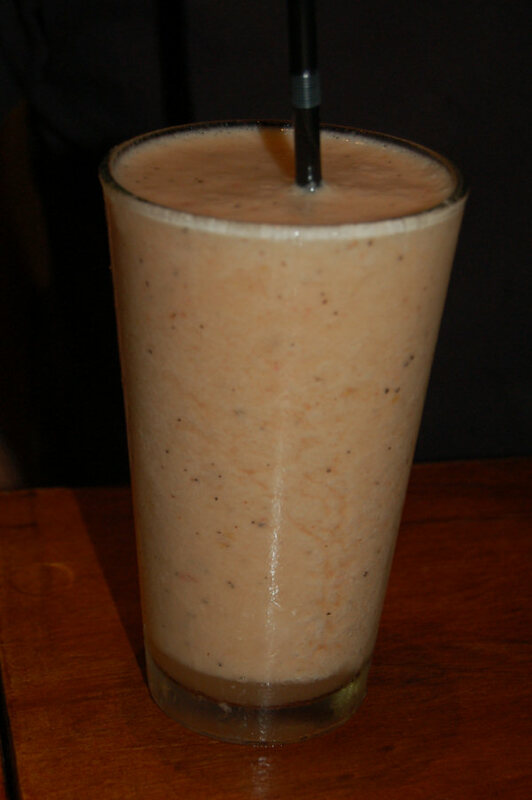 If you can’t decide which frappe you want and would rather have an entire fruit salad in a glass then may we suggest the fruit salad whip ($5.50). The menu doesn’t say what’s in it but we could detect overtones of lychee or rabutan as well as watermelon. It does taste fantastic and we’ll be having it again when we return. 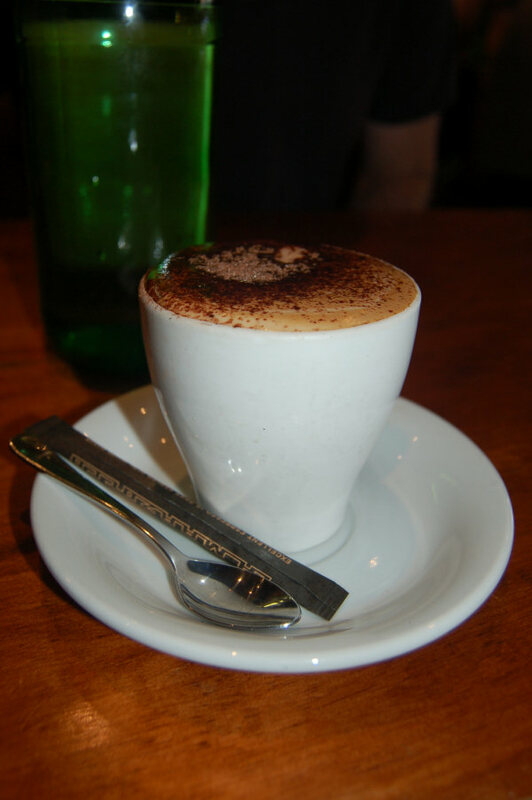 Allpress coffee – the flavour was superb and can guarantee you won’t be disappointed. Dane: I wanted to experience something different to the usual café fare and being in a Turkish-inspired establishment, I thought the spicy lamb mince on hommus ($11.90) was the way to go. The serving looked insufficient on arrival but it was more than filling enough. The hommus was wonderfully spiced and I had to constantly fight away inbound forks of others who had already snuck a taste. The lamb was spiced as promised but not spicy so chilli fearers can order this without feat. The blend of spices reminded me of North African dishes I have tasted in the past. There was a generous helping of pinenuts that suited the dish well and you’ll also be wishing there was more of the pomegranate roast onions on top. 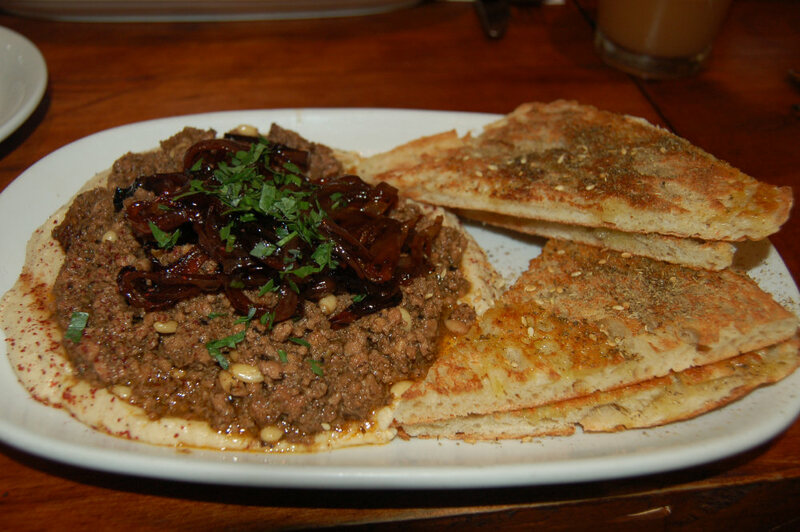 The za’atar toast provided my taste buds with even more flavours and I found myself stealing it from the other plates at the table to scoop more mince onto! April: Being a mostly reformed vegetarian, I shied away from the lamb and chose The Turkish Breakfast ($14.50). I was in heaven. 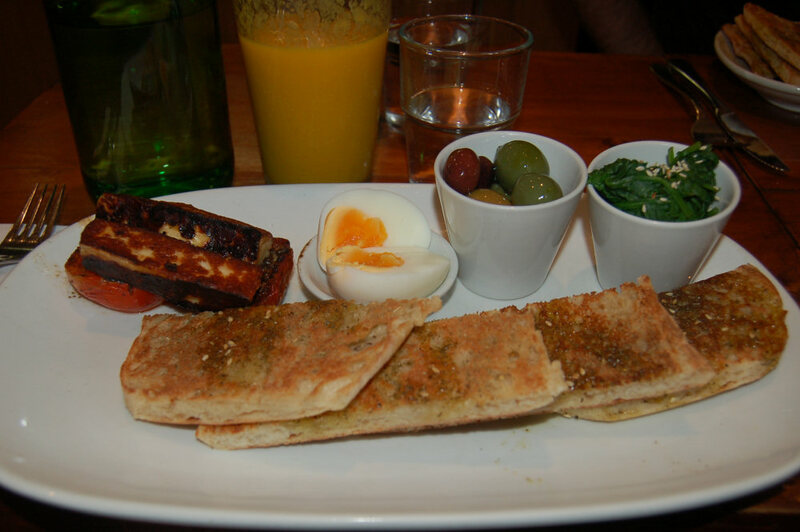 The olives were succulent, the za’atar salty and the haloumi to die for. I loved the small proportions in different dishes and their combined flavours. Can you spot the difference in the pictures above? 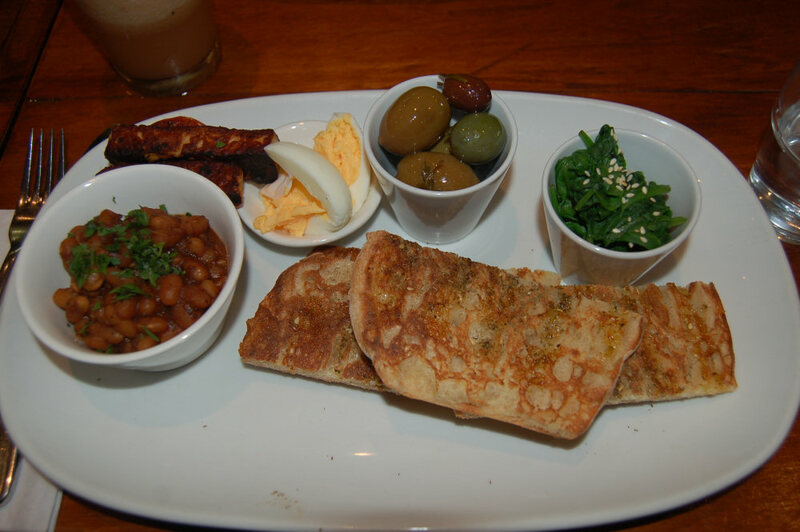 Our guest ordered the Turkish Breakfast with spicy baked beans ($3.50) on the side which was a great decision. I ended up stealing a few mouthfuls when she wasn’t looking which made me squeal with delight. I can’t wait to come back and try some more of the dishes on their breakfast, lunch, dinner and dessert menus. We recommend leaving some time aside afterwards to digest these delicious meals. 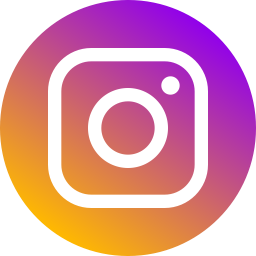 Once this has been done, we propose a light game of barefoot Frisbee on the well manicured grass in front of the quadrangle of Sydney University. What a great way to start a Sunday! This entry was posted in Sydney - Inner East and tagged Outdoor seating, Parking close by. Bookmark the permalink.